Online For Life Saves another Child – Blessings are abundant! Here is an excerpt from an e-mail I received from by good friend Jeff Bradford…..
“We are celebrating 118 lives saved today!! Many of you know that Tricia and I have been giving our time and treasures to help an incredible organization that is making a difference in the fight to save babies! I wanted you to know that we are winning and lives are being saved! The baby in this picture below would not have been born if it had not been for the life saving work of Online for Life and Kathy Hill! Today, the couple has not only chosen life for their child, but they are getting married, and raising this beautiful baby! Many of you know about the Online For Life call we received in February from a young man in Wichita Falls. God used our center to talk this young man into going to a local pregnancy center when we realized that he lived 2 1/2 hours outside of our area. The young man and his ex girlfriend were at an abortion facility. This was on a Wednesday. They had just scheduled an abortion to take place on Saturday. After speaking the TRUTH to this young man about abortion, he agreed to go for a sonogram with his ex girlfriend. They decided they would parent instead of abort. They were not together but still wanted to be good parents to the baby. That baby was born on August 13th. I had the great honor of meeting Baby “A” and her precious parents. They are back together and will be wed sometime in December. Praise God for opportunities like this, that OFL brings. I have attached pictures of the baby and the parents. There are two pictures of me holding this precious one. I was fine when I met the parents, but, when I picked up the baby, I could not stop the tears!!!! To all of you at Online For Life. Keep up the good work. Fight the good fight and believe that HE will provide all that is needed to keep OFL going. BLESSINGS ARE TRULY ABUNDANT INDEED!! THANK YOU ONLINE FOR LIFE!! This baby was saved because of Online for Life! But thousands more are still at risk! Friends, you can help save babies by supporting Online for Life. For just $1.00 a day you can help connect a woman in crisis to a Christ-centered pregnancy resource center. · You can help her get an ultrasound picture of her baby! · You can help her see her baby! · You can give her the incentive to save her baby. Herman Cain – Check Out Who He Is……You Decide! Hat Tip to Donna Garner for compiling these videos. Join me next Saturday for a Social Media/New Media Boot Camp! Learn the tools to join in the Battle from the convenience of your home. The workshop is free but the Texas Patriots Tea Party is reserving the hotel space. Bring your laptop if you have one. There will be wi-fi connection available. A Special CAll to ACTION for the over 50 Crowd. WHY – How did Obama win by a 10 million vote margin in a country where the majority of its citizens proclaim to be conservative? So…when it comes to social media, you should wear your politics on your sleeve get educated by asking your children and grandchildren to help you learn about Facebook, Twitter, and LibertyLinked.com. They need to hear your stories and why you know the Left is not Right but Wrong!! If you don’t have friends and family to ask for help Voices Empower will be there to train and support you and give you the tools you need to be in the conversation and the class above is the perfect opportunity to gain the skills needed to help “Drive the Narrative”. Help us FLIP the FUNNEL with New Media Aggregation! Interesting to note, Chris Turner referenced in the article below was at the training session I taught with Anita Moncrief during CPAC -AFP’s Right ON-Line in Florida on Friday. Also interesting to note- (See the screen shot below) taken from Murphy Turner Associates FaceBook wall. Please take special notice in the article below. “Like Eppstein, Murphy Turner has a direct connection to House Speaker Joe Straus, working for his re-election. Murphy Turner accepted direct payments from the Speaker for ad work, according to Texas Ethics Commission records. It is time for “Conservative Information Pushers” to flip the funnel. I have a feeling Chris Turner did not appreciate the Flipping the Funnel slide during my presentation. The question now is….. why is Gov. Rick Perry using the same Political Consulting team as Speaker of the House Joe Straus? After the results from the Florida Straw Poll that may not have been the best idea. Another great article by Daniel Greer from the AgendaWise.com team. How do you know if a “conservative” candidate is or isn’t conservative? How can you know what a candidate’s promises are worth? One of the most important factors is something average Texans aren’t up to speed on: political consultants. A candidate’s political consultant speaks volumes. Last month Mike Hailey of the Capitol Inside opened the door to this issue, highlighting a race between Bennett Ratliff and Matt Rinaldi. Hailey rightly used campaign consultants as a proxy for House Speaker politics, with consultant Bryan Eppstein on the Speaker’s side and consultant Kevin Brannon on the conservative side. Bryan Eppstein represents several other Speaker allies besides Ratliff. Eppstein has a consistently liberal client track record. Other consultants have tracked a different course. Comprised of consultants Craig Murphy, Chris Turner, and Wayne Hamilton, the “Murphy Turner” client lineup has, over time, gone from shaky to bad. Like Eppstein, Murphy Turner has a direct connection to House Speaker Joe Straus, working for his re-election. Murphy Turner accepted direct payments from the Speaker for ad work, according to Texas Ethics Commission records. Additionally, Murphy Turner has worked for moderate Republican Jim Pitts from Waxahachie for years. Pitts has been a thorn in the collective conservative side since his rise to power alongside moderate House Speaker Joe Straus. A google news search for Jim Pitts reveals he has recently been embroiled in a controversy over hosting an event for LGBT political activists at his home in Highland Park. The posh suburb North of Dallas is not part of Pitts’ district. The Texas Republican Party platform, which Pitts bi-annually runs on, promotes laws protecting traditional values. Once upon a time Murphy Turner counted conservative State Rep. Bill Zedler as a client. While a Murphy Turner client, Zedler lost his 2008 election to Democrat Chris Turner (no relation to Chris Turner of Murphy Turner). In 2010 Zedler hired a new consultant. Murphy Turner recruited a new client to challenge Zedler. Zedler won the primary over Murphy Turner’s moderate selection. They failed to take out Zedler in 2010 but succeeded in taking out a stalwart conservative in 2008. Nathan Macias was replaced with Doug Miller who, in two subsequent sessions, has failed to live up to Macias’s conservative record. Consultant influence doesn’t stop at elections. Consultants often wear the pants in the relationship, given that they often recruit the candidate. Consultants know which crowd can fund campaigns and often steer their canddiate to be in the right crowd. Knowing your candidate’s mettle is made easier by knowing which political consultant represents them. Daniel Greer is Executive Director of AgendaWise. Previously, Daniel worked for Empower Texans, a non-profit direct advocacy group focused on fiscal policy in Texas. He holds a B.A. in Government from the University of Texas at Austin. A native Texan, Daniel is a member of Redeemer Presbyterian Church, played baseball at St. Edwards University, and lives in Austin with his wife Karen and their two dogs. Today Governor Rick Perry put out a great ad aimed at President Obama’s “O” jobs. There was radio talk show host out of Dallas that said when he saw the ad it actually moved him to tears, it was so inspiring. 1. Who paid for this ad, was it paid for with money from the large Republican open borders donors? 2. If talk show hosts are moved to tears by an ad run by Gov. Perry and they do not address issues like in-state Tuition for illegal immigrants, are we being sold a bill of goods just like many who were on the left with Obama’s Hope and Change? Below the ad from Perry I hope you will take some time to hear a little Reality Check from the Texas Tea Party Press Conference Videos on Illegal Immigration the Media Won’t Show You. Governor Rick Perry’s new out today…. Here is a Facebook commit on Gov. Perry and his take on Illegal Immigration. Reality check for you from …….. Stolen Lives Quilt is an initiative of The Remembrance Project. 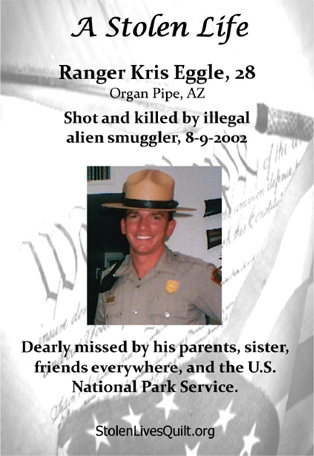 We are dedicated to educating, remembering and honoring Americans whose lives have been stolen by individuals who should not have been in our country. Here is what Maria Espinoza had to say during Monday’s Press Conference.